← What’s on my… August 2nd! August Spoiler Alert! Ipsy. GlossyBox and More! Real quick- here are some spoilers I’ve seen for August boxes!!! I mean.. if you don’t want to see, cover your eyes! However I am super pumped for all of these!!! First up is GlossyBox! I just posted my review on the July GlossyBox a day ago, and was pretty happy with it. Now that i see this spoiler for a Jelly Pong Pong Lip Blush, I’m even more intrigued! Sign up for August’s GlossyBox by using this link so that you too can get this awesome product! Don’t forget JULYMAG for 15% off a sub! Next up is Ipsy! I HAVE 4 SPOILERS FOR YOU, WOAH! Okay so I’m not definite that you’re getting ALL 4 of these products, they may be chosen based on your Ipsy quiz preferences, but they all look good so far! This picture above shows two of the possible items! This silver tube is an Urban Decay Lipstick! Worth $22, woah! I’m not sure if they have different color preferences, but it looks like a bold red and a hot pink may be the options. Additionally, there is a lip balm by Noya that is a kosher and natural balm for soothing your lips. So far I’ve seen flavor options like Classic, Cherry, Spearmint and Vanilla, but who knows what else they have up their sleeves (worth $4). I really hope everyone is getting both of these items, or else there will be some unhappy campers. Now, we have face/body products by Michael Todd! While I can’t confirm what the products are exactly, these deluxe samples could be one of the following: Oat and Honey Cleanser, Pumpkin Mask, Jojoba Charcoal Facial Scrub (or other scrub), one of his many Moisturizers, or one of his few facial Serums. I’m trying to base it off the bottle color/shape/types! Personally, I have my fingers crossed for either a scrub, cleanser or mask! I’ve recieved a lot of serums and lotions lately, so it would be overkill. Finally we have Pixi Beauty Lash Booster Mascara! I love mascara, so I’m pumped! I hope it comes in Blackest Black or Blackest Blue, and I can’t quite tell if it’s a full-size or deluxe sample.. hmm..
Love With Food August Spoiler! Check out these cute bags of chips! I love the summer picnic table cloth-theme of the bags, and like all the different flavors they have to offer. 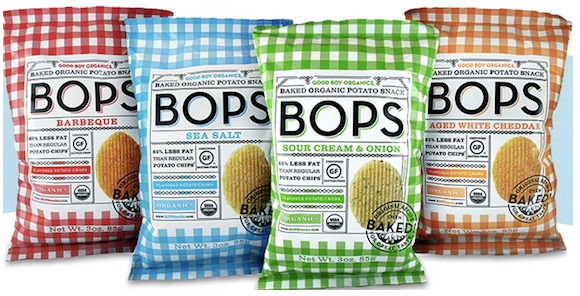 Apparently BOPS are ‘baked organic potato snacks’ and are better for you than regular chips and various other processed snacks out there. Sign up for Love With Food Here. Hope you all enjoyed these! Pingback: Ipsy Glambag ~ July 2013 | stylish in suburbia.